One of my favorite things about spring weather is scarves. Because one of my least favorite things is wearing a coat. (Somehow I managed to survive winter without ever buying one – I do live in Nashville though.) Scarves are perfect for adding warmth on a chilly morning and a touch of chic all day long. And the best kind of scarf? One you don’t have to pay a dime for! I made these scarves from my dad’s t-shirts that were about to be tossed out. Seriously, don’t people know never to throw anything away without checking with the family crafter? 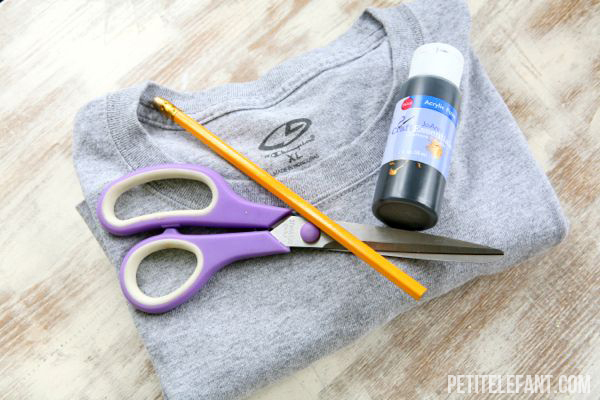 The bigger the t-shirt you can start with the better. A cotton or jersey t-shirt. Again the bigger the better. 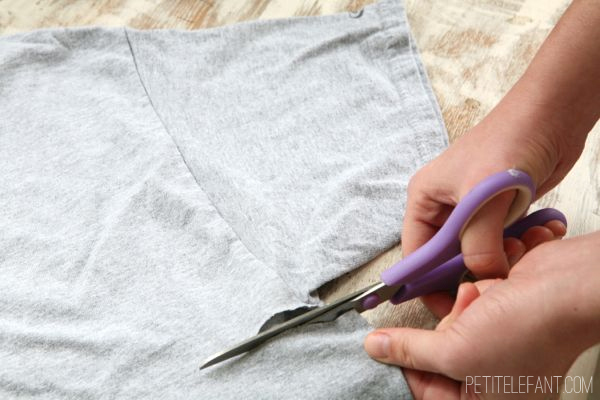 Here’s how to get started: cut horizontally across t-shirt directly under the sleeves. Don’t stress cutting a perfectly straight line. When the ends curl up, no one will be able to tell. Then cut off the hemmed edge at the bottom. Then stretch, stretch, stretch. Use a friend or a door knob to help you pull. Keep stretching until the scarf is long enough to loop twice around your neck. You can see in the photo above how the ends of the scarf curl in. 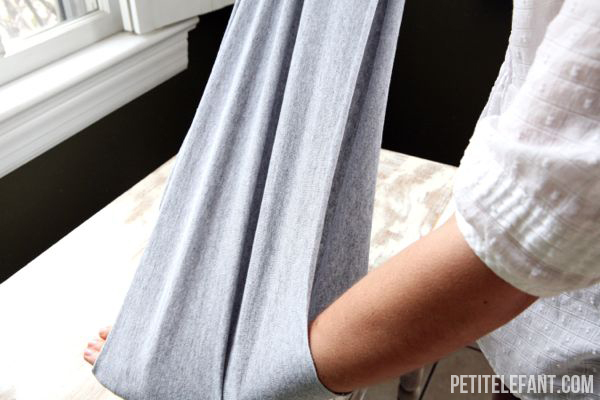 I love this about cotton fabric – hurrah for not having to hem edges! 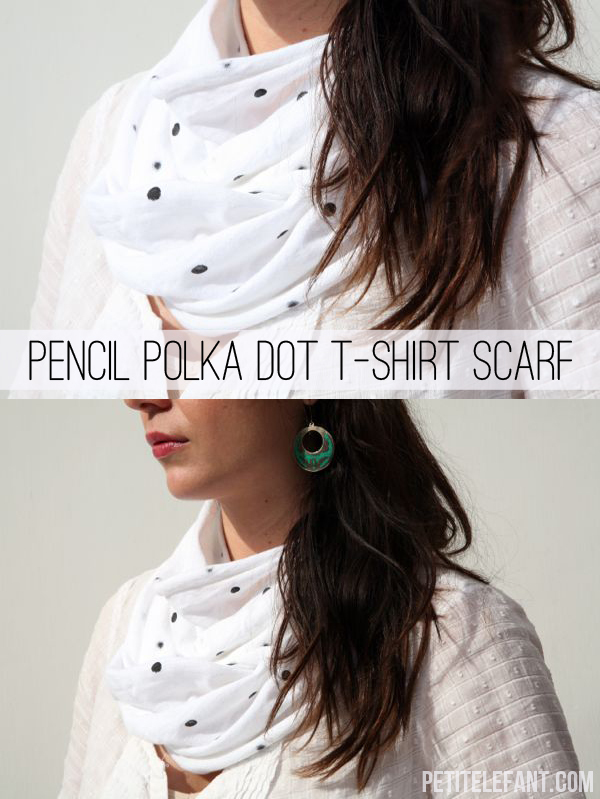 Now you’re ready to polka dot. 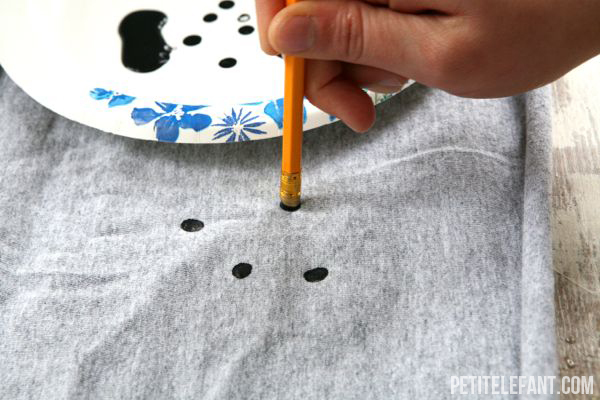 Dip the end of the pencil eraser into the paint and dot away. I didn’t use a pattern because I wanted the dots to look random. 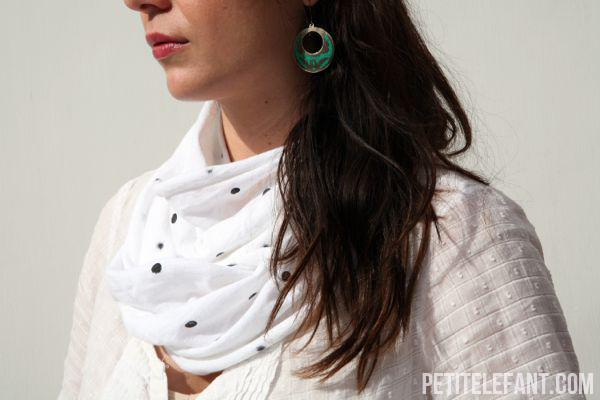 I recommend dotting both sides of the scarf. That way when you twist it around your neck you’ll see plenty of fun little dots. Have fun with colors! This purple scarf looks great with a touch of metallic. But then again you can’t go wrong with classic black and white. What color scarf would you make? 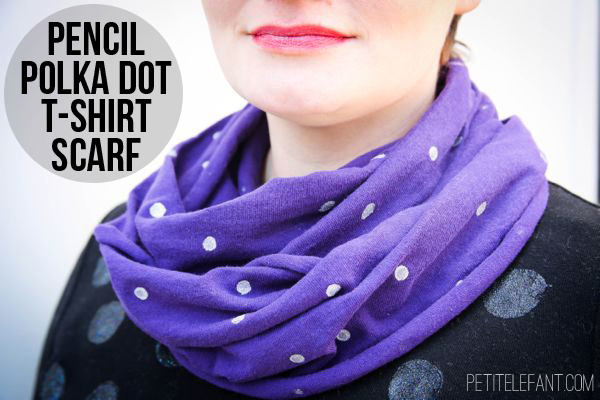 Is a polkadot tshirt scarf something you already know how to do? This is such a cool idea. It looks easy enough that I think I could do this! You totally could Jan! So easy! Wow! I’m so excited to try this! I think I will make a few for my girls, too! We have old t-shirts all over the house. Such a cute idea. (btw, I just came across your website today…….I’m obsessed!) Thanks for all of these fun, and cheap-o ideas! Love it! Made mine with a super soft XXL mens shirt from Goodwill. Now I have an awesome new scarf for under $5. Thanks so much for posting this! I am a serious sucker for a few things in life. Three of them happen to be scarves, polka dots, and repurposing things that my husband thinks we should get rid of. SCORE!